Win World of Hyatt Globalist for 2 years! 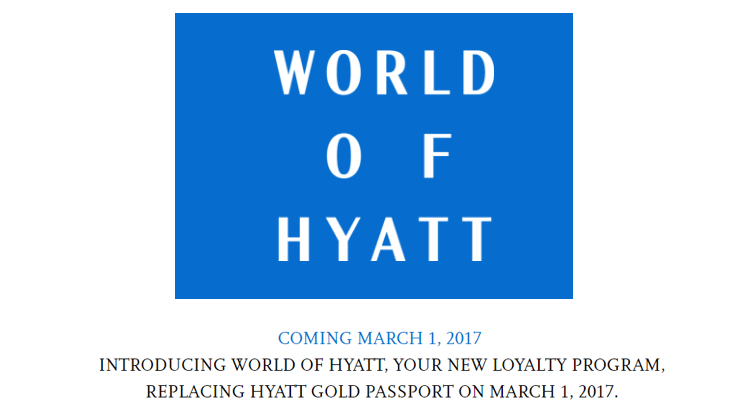 About a month and a half ago, the old Hyatt Gold Passport program was discontinued, and the new World of Hyatt program took its place. To celebrate the launch, Hyatt gave us a chance to share the benefits of the top-tier status with one of our readers. Like I mentioned above, to celebrate the program, World of Hyatt is giving away Globalist Status to one Live From A Lounge reader. Not just that, the winner gets the status for almost two years, through February 2019. That means you do not get a set of confirmable suite upgrades, the Category 1-7 free night, My Hyatt Concierge and lowered nights after 2019 to re-qualify. How do I play to win? There are multiple ways to win. Like we have done in the past, we will run this promotion via the Rafflecopter widget, which will keep score. Leave a comment on this blog post telling us about how would you make the best use of the Hyatt Globalist status if you won it. Giveaway ends April 20, 2017, at 11:59PM India time. All decisions made by Live From A Lounge are final. The winning prize provides for a complimentary year of Hyatt Globalist status in the new World of Hyatt program. Winner will be eligible for the perks and benefits listed at hyatt.com/world through February 2019. Benefits under the “More Rewards Await” section (like the Catgory 1-7 free night, four suite upgrades, My Hyatt Concierge, and lowered nights requirement for the subsequent year) do not come with the prize status, since those are only earned after 60 qualifying nights or 100,000 Base Points in a calendar year. Facebook and Twitter are in no way associated with this giveaway. By providing your information on this form, you are sharing it with me and me alone. We do not share or sell information, and will use any info only for the purpose of contacting the winners. Live From A Lounge is not receiving any compensation from Hyatt to offer this giveaway, and we are happy to bring this Hyatt status to a good home. Good Luck and be sure to make the most of this contest. I travel for a living. This will make my time away from home much better. I know it is difficult to win but I wish I win. Best stay of all is Park Hyatt Goa but the list is long and exhaustive. The best use of the Hyatt Globalist status will have to be at Park Hyatt Goa !! I have a 3 year old and 1 year old, and my wife and I travel all over the world with them. The 3 year old has been to over 12 countries and 1 year old 7 countries. We usually stay at Hyatt where available and having Globalist would really help my wife stay sane when traveling with 2 children (free drinks in lounge, suite upgrade, etc.). Globalist would really help us keep the momentum in traveling the world with 2 little kids!!! I’ll be staying in Dubai and Maldives with my family to enjoy the best of Hyatt properties. I would love to use it on an upcoming trip to Australia and Asia. Thank you. I simply like the new branding: Globalist. Because I am one! I’d start planning more vacations with Hyatt!!! Thank you very much for the giveaway! Would be lovely for both business and personal travel. Exciting! We just reserved using our free nights for the Park Hyatt in Tokyo…breakfast would be amazing. We have an upcoming trip to Hawaii and Puerto Vallarta in the next year and would love to have an elite status with Hyatt so our family vacation can benefit from it. We got married at Dreams Puerto Vallarta ( now the Hyatt Ziva Puerto Vallarta) and want to make our return trip special. I would take my awesome wife on a combined babymoon/2nd anniversary trip to the Park Hyatt Maldives! We would rejoice while eating free food and not paying resort fees on such a fantastic property. Thanks for the opportunity! I would love to take my family on trips to Hawaii, England, France and Asia. Benefits like upgrades, free breakfast and late check out would really come in handy and make the trips even more amazing. We have lots of Hyatt reservations coming up, for a family vacation, a marathon, would love to use the 4pm checkout and breakfast! Would love to be able to use this on my up upcoming around the world trip where I plan to stay at the Grand Hyatt Hong Kong, Park Hyatt Vienna, Hyatt Regency London – The Churchill, the Hyatt Centric Times Square and in the Andaz West Hollywood! Always loved my Hyatt stays and the status would help make this trip that much more incredible! Will be the perfect companion to my Marriott Rewards Gold status. Want to take my wife for her 50th birthday to eat Maine lobsters. Enter me in. Hawaii here I come. I’d use it with my family at the Andaz Myakoba for a suite upgrade! Would love to use some points for an upcoming NYC trip…heard good things about the Park Hyatt. Planning a trip to Maldives with a friends we would really appreciate free breakfast. My wife and I have had some of our most memorable stays in Hyatt Hotels – particularly in Hong Kong and New York City. I’m planning trips for our 5th anniversary, and am looking to book stays at the Park Hyatt Maldives and the Grand Hyatt Bali – I’d love to surprise her with these, and the added benefits of the Globalist tier! It’d be great to enjoy Andaz Maui with the status! My wife and I are staying at the Park Hyatt Sydney for our babymoon. Would love to be able to get free breakfast, since she’ll be eating for two. I would use the status to make the most of a future trip to the new Park Hyatt St Kitts!!!! I’d plan on a luxurious stay at Grand Hyatt Kauai with my Globalist status! Mahalo! No cash out of pocket on award stays. Use the free breakfast benefit at Park Hyatt Sydney. My wife and I will be able to put this to great use right away. We’re staying in 4 Hyatts during our honeymoon in May/June and upgrades/breakfasts would be HUGE in making the trip even more memorable. We also have 2 more years away from our families because of my training but when they come visit they stay in a Hyatt nearby, with all of the effort they make to see us, I’d love to be able to repay them by making their stays that much nicer. Would love to experience Globalist status on our upcoming trip to Hawaii! Hawaii! I’ve never been, and am planning a big trip next year. I would love to be an elite member of any loyalty program so this is the best platform then i would love to utilise the maximum benefits i get through it. My wife and me had a wonderful time at the Hyatt in Kauai just after our wedding. It was the best vacation we ever had. Now, four years later, we have two kids. I would love to go back with my whole familiy to show my this terrific place again, which is right on the beach and has amazing pools. The Globalist status would help me make it affordable, since we could get some snacks in the Club and share a bigger room, maybe even a suite, thanks to a potential upgrade. I’d use it on my next trip to Asia! I would use the gobalist to take family vacations to both Maui and Aruba. Lounge access would be phenomenal as well as upgrades! I will use it to get suite upgrades and free breakfast. Would sure come in handy for upcoming babymoon trip! I have several nights at Hyatt’s booked already. Would love to have Globalist for an upcoming round-the-world trip. I would love to treat my family at Hyatt resorts this summer! Free breakfast would really help my budget. I would head back to Japan. My Park Hyatt Tokyo experience was amazing! I’d stay at all of the fabulous Hyatts in Asia as I feel like the kids are finally old enough to travel Trans Pacific! And the breakfast, I’d indulge in the wonderful Hyatt breakfasts, because calories on vacations don’t count. I would use the benefits while traveling to places as a college student that wouldn’t normally have the opportunity to have such a status. Would love to travel the world in style! I used to be a diamond member. Really miss free breakfast when there is no lounge. We (My family ) are exploring USA one state at a time whenever we can. Tis needs very good planning – read monetary, to make the most. Winning this would make our stay more wonderful because every penny we save on stay will be used to explore more new places as well as we can experience the Hyatt comforts. Hope to win.followed, liked on Fb n Twitter and twitted. I’d love to go experience Sydney and the Maldives… Park Hyatt style! I would use it for my parent’s 50th wedding anniversary trip in Maui at the Hyatt Regency Maui. Thanks for doing this! I love to share my Hyatt points with friends and family. I would love to be able share my Elite perks with them as well!! I would travel more and be sure to stay at only Hyatt’s. Hyatt breakfast is the best. Would continue to use this to bring along friends and gift experiences. Also would be invaluable for my wife who travels a ton. I would go on a tour of Park Hyatt Properties in Asia with my wife! I would definitely travel more. I would love Hyatt Globalist Status for room upgrades and club access! As a student just about to start working, and who enjoys travel, will love the Globalist status to help me explore new places. I also have a love for flying and the program helps earn miles. Great blog, a new but regular reader. I would take my fiancée on her first trip out of the USA in style, either france or spain! I would love to travel to the Asia Hyatt locations to use this Globalist feature. would want to utilize this for some wonder vacations at Hyatt properties. Would love to switch to Hyatt from Hilton ! I am doing a Euro tour in July – this would make the perfect connect. We’d stay at the Park Hyatt NY for our Babymoon!!! Love to introduce my daughter to World of Hyatt with Globalist status privileges during her upcoming birthday stay @ Park Hyatt NY. I love Hyatt hotels, it is my first choice when I travel, however they are not available on most Europe. Would love to have Globalist status when we go on our upcoming trips this year. So far we already have the following trips booked – Italy (various cities), London, Sydney, and Singapore. If I won, we would book Hyatt hotels for all our stays. Also, in the planning stages for a trip to Maldives next year and staying at the Park Hyatt there would be fabulous. Thank you for having this drawing. We are planning a trip to Berlin and would use this to get lounge access and free breakfast! Too bad that Hyatt fixed their loyalty program that wasn’t broken. The breakfast benefit as a Hyatt Diamond member was among the best among hotel chains. Their locations are still the best, and Park Hyatt is a very nice luxury brand. I would have breakfast. Lots and lots of free breakfast. Thanks for giving me a shot at the Regency Club Lounge! I would finally be lured in to staying with Hyatt and benefit from all the great perks from having status! Heck, I would probably finally get a Hyatt credit card! Having my one year old enjoy the luxuries that a top tier can provide to the bookings at top locations such as the Park Hyatt Maldives !! Travel the world and stay in the best rooms in the best hotels. I would stay more often. I would definitely want to use the status at the Andaz Maui which I’ve heard has a pretty nice breakfast! where do i begin… love hyatt hotels. I would love to win. For all my daughter’s gymnastics competitions we stay at hyatt all over Colorado. The extra 30% points would be fabulous for a jump start on next years stays! I’d like to try the famed Park Hyatt Tokyo for sure! We would use this for Maui. The Hyatt Andaz there looks gorgeous! I want to visit Hyatt Goa as you have raved about it so many times. I would try to visit every Park Hyatt in the world! I’m gonna travel to all the hyatt hotel pools on my bucket list. We would plan a trip across Hyatt properties in North America for our tenth anniversay! I’d use it on my trip to Europe this summer to get breakfast (room service) and room upgrades when I stay in Hyatts in Paris, Nice, Milan! Globalist status would score me free breakfast and nice upgrades at the Park Hyatt Milan! Thanks for offering the giveaway! I have three stays already booked at Hyatt this year and another 5+ I could book at a Hyatt if I had Globalist status. Then next year I could really focus on maximizing the status basing my trips around that. We love having club access at hotels. I am going on Trip to USA for the first time in my Life, I would like to enjoy Hyatt Hospitality in all the cities I travel to in the states. If I win, I may try out the Park Hyatt Maldives Hadahaa with my Globalist status. I would enjoy rooom upgrades and especially free breakfast during my upcoming trips to the US together with my +1. As a dad to two hyperactive 3 year olds, it has always been a struggle to fit ourselves into the relatively smaller standard rooms of hotels, when we travel together. A Hyatt Globalist status will give us that extra space and flexibility to keep continuing traveling as a family, at least for the next 2 years. Travel around Asia with my kids. Love to use it on the US Vacation next time to enjoy the Hyatt Hospitality. I’d use it for a family trip we’re planning to San Francisco to celebrate my dad’s 70th birthday. It would be great to celebrate in a suite!! I will travel with my family, there free breakfast and resort fess save a lot. Suite Upgrade…@ Park Hyatt Goa, when i book a stay for couple of days there later this year…. If use it to upgrade to a better room at the Park Hyatt Goa. Go there with the Kids as it’s a superb property, very child friendly and great for us too. Hyatt Globalist status…will use the room upgrade feature to upgrade to a suite when I book a nice vacation at Park Hyatt Goa some time later this year. Since being new to World of Hyatt, having Globalist status will be an awesome opportunity for me to try out and experience Hyatt branches all around the world. I would use the status on the family holiday to the UK this Summer, where we have a special celebration. Also on weekend trips around Asia. Thanks for the chance to win. @MA how can I when you never even bothered to read the question and answer accordingly. I’ll use it to access the wonderful Club Lounges at Hyatt properties! Thank you so much! I would quit worrying about how i’m going to qualify next year? Would like to use it for status and upgrades on upcoming stays. Globalist would surely help us in Priority access to available rooms upon checking in early and also late check outs – Looking forward to multiple Hyatt Stays if I get this!! I would defintely take my parents around the best properties Hyatt has. They deserve it; after all the hard word they done in there life. we are planing to have few family vacations in 2017/18 and would defiantly shift our loyalty to hyatt if they make me a globalist ! plus i might retain my status for 2019 if i do 60 nights in 2018. correct ? I have couple of trips planned for the later half of the year. Would love to use the status on those trips. We would take our kids to visit family in Milan. Immerse them in Italian language and culture. I would eat a big breakfast at Hyatt every day. I’d go to the Vendome Hyatt in Paris! 4pm checkout for an international trip basically allows you to gain an extra day of siteseeing and a shower before a red eye back to the USA! Hyatt’s good. Livefromalounge’s great. Combo is terrific! I’d wake up to gorge on breakfast, the go to sleep until 3:50. Thanks for holding this contest! I have quite a few trips planned for the remaining of this year, (where did time go, I can’t believe I just said remaining of the year), and also for part of next year. For this year, I have a few family weddings to go to. I actually have one at the end of this month and May. For the wedding at the end of this month, I wasn’t planning to stay in a hotel and just do the drive in the early AM and come back afterwards to save some money, but if I were to win, there is a Hyatt nearby that I can book. Having Globalist status couldn’t come at a more perfect time! I would be able to stay at the Hyatt the night before/night of, possibly get a suite/larger room so my family, the little ones, and I can get ready. This would also give us the chance to be well rested so we can focus our energy on celebrating my cousin’s marriage! As for the wedding next month, I already have a Hyatt booked so having Globalist would make the stay even better! It will hopefully give us a larger room, and my little ones can have a special treat and experience a Hyatt breakfast the morning after. Party all night long, and not having to worry about looking for a place for breakfast for the little ones the next morning sounds awesome to me =). Besides family weddings, we also have a family trip to Toronto for July 4th! I have the Hyatt booked already so this would be a huge positive for us since we can potentially get a bigger room (for the little ones to run around hehe), and also not have to worry about breakfast since we’ll be visiting a new city. I also have a special anniversary trip in Sept, and I will be “vendome’ing” it at the PH! I’m sure having Globalist there will be extra special =). Besides those trips, I usually do one big birthday trip during Feb, and I currently have a big trip planned for Japan and Seoul! I don’t have hotels booked yet, but I do have my flights. Having Globalist status would be perfect since that will solve my hotel research, and I can default to the two PH’s in Tokyo and Seoul that I’ve been hearing and reading so much about! I’m sure I can go on and on, so I will stop here. Thanks again! Have a fab day!! I jumped off the hamster wheel, and left my job to study and travel… the status will get plenty of good use over the next 2 years. I’ll actually be committed to a single brand of hotel when I travel! I am on my “trip of a lifetime” with my partner, and we are in Melbourne Australia, and slowly make our way up north over the rest of the year, covering indonesia, singapore, malaysia, philipines, vietnam, cambodia, thailand, hong kong, taiwan, china, korea, before ending in Japan. Both of us have been saving miles to pay for the flights, but unfortunately neither have any great point balances in hotel programs. A lot of the places we will be visiting have Hyatt properties, and having Hyatt status will mean free breakfast and club lounge access, which makes a huge price difference compared to I were to pay in cash. Not to forget the potential upgrades, which even though it is subject to availability, having a chance to experience suites that I could never afford on a trip this long, will really make this extended vacation magical. Looking to a lot of travel with my new Southwest companion pass so plenty of hotel nights needed! This would be so handy for my upcoming stay in Melbourne, Australia! Man, I hope I win!! I would Lounge, Lounge, and LLLLLLooooounge. I would love to have globalist status in future Hyatt stays at San Antonio and Montreal! I have multiple trips planned but my honeymoon trip would benefit from Globalist status. Thanks! Looking forward to Hyatt status! I’d use my new Hyatt One Status as an excuse to travel all across India and Asia exploring new destinations ! I’d use it for my upcoming trip to Hawaii for my 20th anniversary. If we had Globalist status, I would stay at Hyatt hotels to celebrate my wife’s 50th birthday this year, my 50th next year, and our 25th anniversary next year, and enjoy the benefits of Globalist status, such as potential room upgrades, having nice breakfasts (especially at the Andaz Napa and Maui), enjoy the lounges such as the one at the Hyatt San Francisco, and not having to pay for parking. Nice! I will bring my wife and kids to see the world and get upgraded at Hyatt hotels! I’d use it in Napa! I would use it at the Park Hyatt Milan this summer! Staying at Andaz Papagayo and Dubai hyatt with family which includes a 3 year old. The status would definitely help with expenses. Would love to take my parents to several of the Grand Hyatts in Asia — and the globalist/aka diamond status will come in very handy with lounge access and suite upgrades! Grand hyatt Playa del Carmen!! I will be more than happy to make new trip to NY. I would go back to Park Hyatt in Europe. Paris and Milan! It would be helpful for the vacation to Hawaii. Who wouldn’t want to have Hyatt Globalist status for 2 years? Planning some trips to the Caribbean and Europe, so this would really add cherry to the cake. Awesome giveaway, I travel to cities with many Hyatt properties but don’t stay there as I don’t have status with Hyatt. It will be of huge help to get the globalist status ! I could use Hyatt Globalist status for my stays in the Asia-Pacific region and Mexico! It would be great to use in New York City at anyone of the many Hyatt hotels in that great town. I would make use of it on our trip to Washington DC this summer. It’s sounds so nice! I’d like to stay Park Hyatt Siem Reap and Hyatt Regency Kyoto! Can’t wait to try out Globalist. Thanks for the opportunity to win. I will use this status to travel to Park Hyatt Maldives! Would love to get free breakfast with every Hyatt stay! Would love to get some upgrades for the family! I would like to take my family to Park Hyatt Tokyo! Would really help to maintain status with Hyatt, which is not easy being based in Europe. This is a really good giveaway. Congrats to whoever earns it..
NYC,Miami,Vegas and Mumbai… Looking forward to Hyatt elite now that SPG is merged with Marriott..
Would love to have this status when I burn my 4x Hyatt free night sign up bonus certs in Sydney!!! Would be great to use this at Mallorca! I would use this opportunity to get reacquainted with Hyatt. Been hanging with Hilton for too long. I would use it to help move my IHG and Hilton top tier status over to Hyatt. Oh does anyone like Rafflecopter? Sign me up for free parking on award stays! My husband-to-be and I are spending our 12-night honeymoon in October at the Park Hyatt Paris and Park Hyatt Mallorca (all on points, thanks to bloggers like you!). The late checkout, free breakfast, and potential suite upgrades provided by Globalist status would make what is sure to be the trip of a lifetime even more special! Would Love to keep staying with Hyatt!! Have a few trips coming up to Cancun and Miami. I would use this for club access and larger rooms for my 6 person family! I love Hyatt properties already, but this would make them perfect! I already love to stay at all of the Hyatt brands for work travel and my wife and I particularly love Park Hyatt and Andaz for our leisure travel. Due to work being slower last year I lost Hyatt Diamond status and would love an opportunity to have Globalist for the benefits during upcoming Hyatt stays! Would use at the Andaz Papagayo! I would love to have the status and finally enjoy the FAMOUS HYATT HOSPITALITY that the ELITES ENJOY. I would hope to use it to upgrade award stays! why don’t we give this to Dr Dao so he can recover from the United incident in peace or paradise? I would enjoy certainly start staying at Hyatt while I had the Globalist status and perks that come with it. I don’t travel enough to attain that kind of status but I could sure make use of it when I travel to London and Australia in the next couple of years. I am all ready missing my Hyatt status, so this would be great to have again! Going to Hawaii in Summer of 2017 Globalist at the Hyatt Maui and Hyatt Kauai would be awesome, Family of 7 is not cheap, but those lounge passes and extra space in a suite would let this family live large on little money. I travel frequently for work and vacation and would love the free suite upgrades. My wife and I are traveling to Maui in a week for our first anniversary. We are new to the points and miles game and don’t currently have any status. This would be a huge benefit to be able to upgrade to a suite as we are booked in a resort room at the Hyatt Regency at the moment. We also have a few out-of-state weddings to go to this year that would make our experiences much more enjoyable! Best use of Globalist? What all the bloggers seem to drool over…free breakfast all over the world, lol. Book my upcoming Honeymoon in all Hyatts, especially Park Hyatts!! Prior diamond, lost it because my baby was born. Looking to get it back to bring her to all the great places hyatt has hotels. Having Hyatt Globalist Status would really help me out with my honeymoon in late 2017. We will be doing an around the world trip and will be staying in Hyatt Hotels that the Globalist status would give us incredible value at. We will be redeeming Hyatt points earned through Ultimate Rewards and free nights from Hyatt Branded Credit Cards at the Park Hyatt Tokyo, Park Hyatt Maldives Hadahaa, Park Hyatt Vendome, and Park Hyatt New York. This trip has been a long time in planning and having Globalist status would be a tremendous value, and make our honeymoon even more worthwhile and incredible for my fiancee and I.
I’d use it every time I travel for business and personally. I’m planning my round the world star alliance reward ticket. I can use this for a possible upgrade at the Park Hyatt New york, Andaz Liver pool street and Park Hyatt Shanghai Bund. I can also use it in Hawaii during my summer getaway. Business travel, personal travel. This would be useful for all those. 1 week in Amsterdam, 2 weeks in Canada! I would love to be able to have lounge access and save on breakfast costs! Love Hyatt hotels! Would benefit greatly from wining this giveaway! Do mini RTW and stay at Hyatt properties. I have enough points for J class ticket and the status would be a cherry on the cake! I would use it to celebrate my wedding anniversary ay Grand Hyatt Bali. I think I’d use it on my upcoming anniversary trip with my wife. The Hyatts in Bangkok and Danang would be especially nice stays in a Suite. We would use the benefit at the Grand Hyatt in DC and take our granddaughter. I’ve never had the top tier status – it would certainly help my last trip with my wife as 2 this summer, as we are expecting a little one on October! thanks! I travel a lot for work and often stay at hyatts. this would rock! I will take advantage of my hundreds of thousands of Chase UR pts via transfer to Hyatt. Then I will make guest of honor bookings for myself and my friends who travel with me to double up on the Globalist benefits. I would use it for my honeymoon. I would use my status to cities with best Hyatt on points, and hope to be able to upgrade to suites. Awesome contest. Would like to take the family and explore the world. And my cat would like all the international toys I would bring home. Would use on all of my business trips to have a nicer stay! I would stay at the Grand Hyatt Kauai! Thanks for this chance to win Hyatt status. I would use it to make an already planned trip with my through Asia even more special. Already had my on booking at Park Hyatt’s in Siem Reap and Tokyo, so the benefits (Breakfast, upgrades etc) would be extremely useful. I would take my son to the beach for his first bday! The free breakfast makes it so much more affordable. The larger rooms are great when u need a crib. I would like to use the free room upgrade for Hawaiian trip next year! I’d use status for the breakfast benefit and upgrades during my planned trips to the Park Hyatt Maldives and the Andaz Papagayo. What a cool giveaway. I would use this to take my wife fro a belated Anniversary trip to one of the cooler Hyatt properties recommended herein! I would make most of the globalist status by visiting park hyatt zurich and milan in the fall time when i have a big europe trip with my wife for our 18 month anniversary! free breakfast, upgrade possibilities, and other benefits would be very much appreciated! We are planning a once-in-a-lifetime trip to Asia, would love to have Hyatt globalist, since Hyatt has terrific hotels in Asia that I’ve heard friends rave about!